In recent years, the incidence of carbapenem-resistant Enterobacteriaceae (CRE) infections has increased rapidly. Since the CRE strain is usually resistant to most of antimicrobial agents, patients with this infection are often accompanied by a high mortality. Therefore, it instigates a severe challenge the clinical management of infection. In this study, we study the in vitro and in vivo bactericidal activity of ceftazidime-avibactam administrated either alone or in combination with aztreonam against KPC or NDM carbapenemase-producing Klebsiella pneumoniae, and explore a new clinical therapeutic regimen for infections induced by their resistant strains. The microdilution broth method was performed to analyze the minimal inhibitory concentration (MIC). The time-kill curve assay of ceftazidime-avibactam at various concentrations was conducted in 16 strains of KPC-2 and 1 strain of OXA-232 carbapenemase–producing Klebsiella pneumoniae. The in vitro synergistic bactericidal effect of ceftazidime-avibactam combined with aztreonam was determined by checkerboard assay on 28 strains of NDM and 2 strains of NDM coupled with KPC carbapenemase–producing Klebsiella pneumoniae. According to calculating grade, the drugs with synergistic bactericidal effect were selected as an inhibitory concentration index. The in vitro bactericidal tests of ceftazidime-avibactam combined with aztreonam were implemented on 12 strains among them. Effect of ceftazidime-avibactam antibiotic against KPC carbapenemase–producing K. pneumoniae strain Y8 Infection was performed in the mouse model. 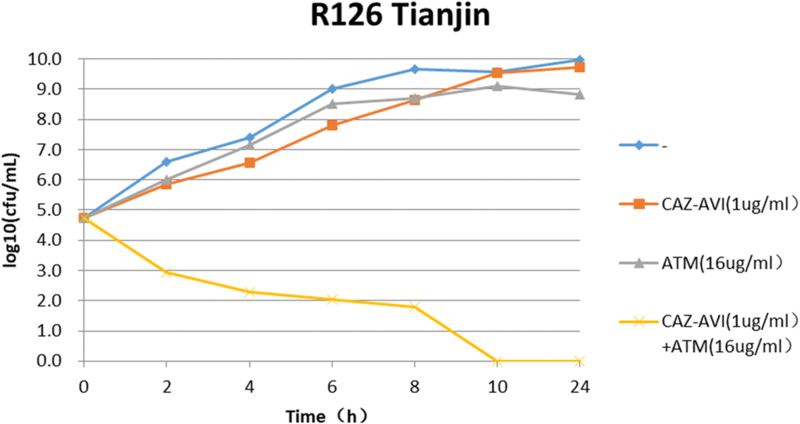 The time-kill assays revealed that ceftazidime-avibactam at various concentrations of 2MIC, 4MIC and 8MIC showed significant bactericidal efficiency to the resistant bacteria strains. However, in 28 strains of NDM and 2 strains of NDM coupled with KPC carbapenemase- producing Klebsiella pneumoniae, only 7 strains appeared the susceptibility to ceftazidime-avibactam treatment, MIC50 and MIC90 were 64 mg/L and 256 mg/L, respectively. Antimicrobial susceptibility testing of ceftazidime-avibactam combined with aztreonam disclosed the synergism of two drugs in 90% (27/30) strains, an additive efficiency in 3.3% (1/30) strains, and irrelevant effects in 6.6% (2/30) strains. No antagonism was found. The subsequent bactericidal tests also confirmed the results mentioned above. Therapeutic efficacy of Ceftazidime-Avibactam against K. pneumoniae strain Y8 infection in mouse indicated 70% of infection group mice died within 4 days, and all mice in this group died within 13 days. Bacterial load testing results showed that there was no significant difference in the amount of bacteria in the blood between the infected group and the treatment group. However, the spleen and liver of treatment group mice showed lower CFU counts, as compare with infected group, indicating that ceftazidime-avibactam has a significant effect on the bacteria and led to a certain therapeutic efficacy. This study indicated ceftazidime-avibactam therapy occupied significant bactericidal effects against KPC-2 and OXA-232 carbapenemase-producing Klebsiella pneumoniae. While combined with aztreonam, the stronger synergistic bactericidal effects against NDM carbapenemase-producing Klebsiella pneumoniae were achieved. Carbapenems are considered the most effective antibacterial agents against infections caused by multi-drug resistant gram-negative bacillus in clinical practice. However, with the broad use of carbapenems, and the emergence and widespread of carbapenem-resistant Enterobacteriaceae (CRE), in particular carbapenem-resistant Klebsiella pneumoniae (CR-KP), the clinical anti-infection treatment faces a drug-free dilemma [1–4]. Previous studies have shown that the most important resistant mechanism of CR-KP to carbapenems is production of carbapenemases including class A KPC carbapenemases, class B metallo-β-lactamases and class D OXA-48 family carbapenemases. Avibactam is a newly developed novel β-lactamase inhibitor in recent years and can efficiently inhibit class A and class D carbapenemases. As an inhibitor, avibactam can restore the antibacterial activity of ceftazidime to CR-KP. Nevertheless, it has less antibacterial efficiency against CR-KP with metallo-β-lactamase [5–7]. Knowing that aztreonam is stable against hydrolysis by class B metallo-β-lactamases, we hypothesized that supplement of aztreonam to the ceftazidime-avibactam would enhance the activity by “protecting” aztreonam from the “attack” of KPC type carbapenemase. This study aims to explore a new therapeutic regimen by administration of ceftazidime-avibactam alone or combined with aztreonam against carbapenemase-producing Klebsiella pneumoniae. A total of 47 non-repeated clinical strains of carbapenemase-producing Klebsiella pneumoniae were collected from 9 hospitals in 9 cities in China. Of these, 16 strains were blaKPC-2 positive, 1 was blaOXA-232 positive, 28 were blaNDM positive, and 2 were blaKPC2 coupled with blaNDM positive Klebsiella pneumoniae. All strains were identified by mass spectrometry and the gene type of carbapenemases was analyzed by PCR amplification using primers previously described and DNA sequencing [8–10]. E. coli ATCC 25922 were used as quality control strain for antimicrobial susceptibility testing. One K. pneumoniae clinical strain Y8 was used for the Infection in the mouse model. The minimal inhibitory concentrations were determined by microbroth dilution according to Clinical and Laboratory Standards Institute (CLSI) guidelines . The in vitro synergistic bactericidal effects of ceftazidime- avibactam combined with aztreonam against blaNDM-positive strains were determined by checkerboard assay referred to the published reports [12, 13]. The calculation and interpretation of fractional inhibitory concentration (FIC) was referred to the document standards . FIC = MIC drug A / MIC drug A plus drug B + MICdrug B/ MIC drug A plus drug B. FIC ≤ 0.5 was considered as a synergistic effect, 0.5 < FIC ≤ 1 was considered as an additive effect, 1 < FIC ≤ 2 was considered as an irrelevant effect, and > 2 was considered as an antagonism. 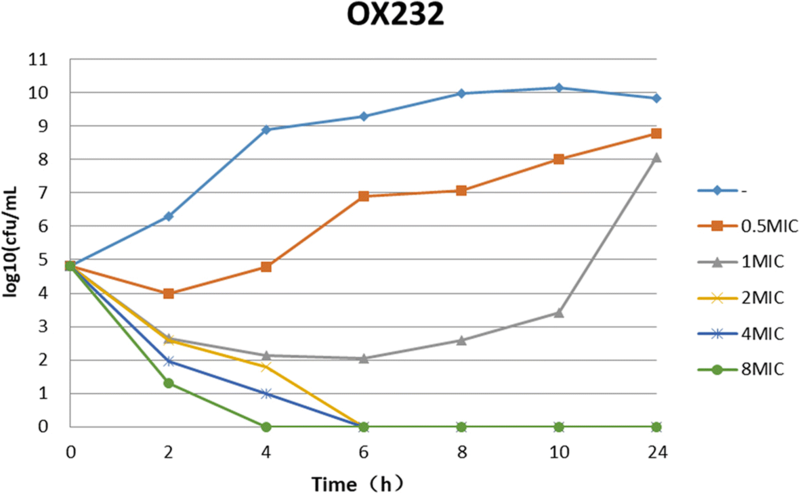 According to the minimal inhibitory concentration (MIC) of ceftazidime-avibactam to blaKPC-2 or blaOXA-232 producers, the bactericidal effects of ceftazidime-avibactam at various concentrations of 0.5MIC, 1MIC, 2MIC, 4MIC and 8MIC were studied by time-kill assay. In line with the results of antimicrobial susceptibility testing of ceftazidime-avibactam combined with aztreonam, and following the methods recommended in literatures [15, 16], 10 Klebsiella pneumoniae strains with blaNDM and 2 Klebsiella pneumoniae strains with blaNDM coupled with blaKPC-2 were randomly selected for synergistic bactericidal effects. The operation procedure is briefly described as follows: Mueller-hinton broth containing 1 × 105 CFU/mL bacteria is mixed with single or combined antimicrobial agents incubated overnight with consecutive shacking at 35 °C in an atmospheric environment. Meanwhile, the same broth without antibiotics was served as a growth control. Broth samples were serially diluted at times of 0, 2, 4, 6, 8 and 10 h and smeared on a mueller-Hinton plate respectively. After overnight incubation at 35 °C, the colonies were counted. If the reduction of bacterial survival amount in sample treated with combined antibiotics was ≥2 log10 CFU/mL than those in the sample treated by single drug, it was considered to have a synergistic bactericidal effect. Six-week-old BALB/c mice (female) were bought from Shanghai Laboratory Animal Company (SLAC), China. Animal experiments were performed in accordance with the Animal Ethics Committee of Shanghai Jiao Tong University. Groups of 10 mice were infected with 2.5 × 106 CFU of strain Y8 via the intraperitoneal (ip) route. Then mice were treated with PBS (infection group) or ceftazidime-avibactam (treatment group) (0.375 mg/g of body weight in 0.1 ml PBS) by subcutaneous injection 4 h post infection and given every 8 h for 10 days. The survival rates of mice were measured at desired time point to assess the therapeutic efficacy of ceftazidime-avibactam. Survival curves were monitored for 15 days. To measure the efficacy of this drug, the bacterial load was measured in the blood and tissues of mice. Groups of 8 mice were infected with 2.5 × 106 CFU of strain Y8 via the ip and then treated with PBS or ceftazidime-avibactam by subcutaneous injection. The antibiotic dosage and administration were same as the survival experiment mentioned above. At 3 days post infection (dpi), mice in treatment and infected group were euthanized, and the blood and tissues of mice were removed to determine the bacterial burden through bacterial dilution-plate method. All 16 Klebsiella pneumoniae strains with blaKPC-2 were susceptible to ceftazidime-avibactam with MIC range for 4–8 mg/L. However, all of strains were resistant to ceftazidime with MIC50 of 32 mg/L and MIC90 of > 256 mg/L. The resistance rate of imipenem was 93.8% with MIC50 and MIC90 for 64 mg/L and 128 mg/L, respectively. The resistance rate of meropenem was 93.8% with MIC50 and MIC90 for 64 mg/L and 256 mg/L, respectively (Table 1). The MIC of ceftazidime-avibactam to one OXA-232 carbapenemase-producing Klebsiella pneumoniae was 2 mg/L. The resistance rate of ceftazidime-avibactam to 30 blaNDM (including NDM plus KPC-2) positive Klebsiella pneumoniae strains was 76.7% with MIC range for 0.5~ 256 mg/L, MIC50 and MIC90 for 64 mg/L and 256 mg/L, respectively. The MIC range of aztreonam was 8~ > 256 mg/L with MIC50 and MIC90 were 128 mg/L and > 256 mg/L, respectively. Ceftazidime-avibactam combined with aztreonam showed synergistic effects to 90% (27/30) of strains with blaNDM, 3.3% (1/30) showed additive effects and 6.6%(2/30) showed unrelated effects. No antagonism was found for ceftazidime-avibactam combined with aztreonam (Table 2). The results of time-kill assays showed that all blaKPC-2 or blaOXA-232 positive K. pneumoniae strains rebounded to grow 4 to 6 h at 0.5 MIC of ceftazidime-avibactam. At the concentration of 1 MIC ceftazidime-avibactam, 23.5% (4/17) of strains declined stably 2 h after dosing and no colonies were detected at 24 h, however, 76.5% (13/17) of strains rebounded to grow in 4–6 h. At the concentrations of 2MIC, 4MIC or 8MIC of ceftazidime-avibactam, it showed a significant bactericidal effectiveness for either blaKPC or blaOXA-232 positive K. pneumoniae and the colony growth was undetected after 24 h incubation for most of strains (Fig. 1 and Fig. 2). For blaNDM positive K. pneumoniae, ceftazidime-avibactam combined with aztreonam showed a significant bactericidal effectiveness and the colony growth was undetected after 10 h incubation (Fig. 3). Mice were infected with 2.5 × 106 CFU of strain Y8 and treated with PBS or ceftazidime-avibactam for 10 days. 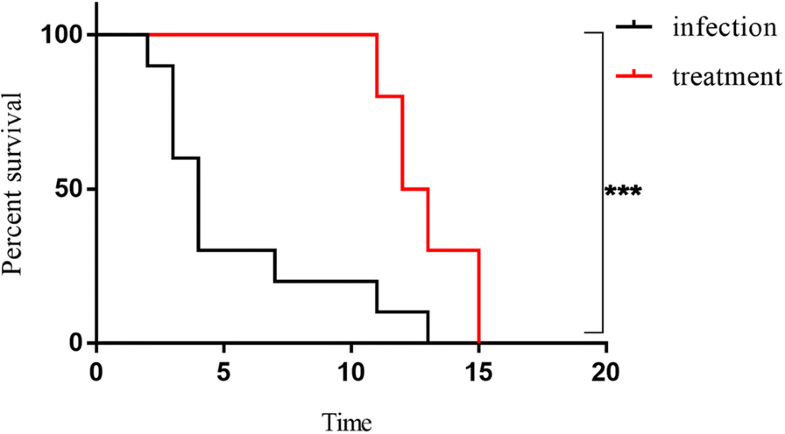 70% of infection group mice died within 4 days, and all mice in this group died within 13 days (Fig. 4). All treatment group mice survived at 10 dpi with the antibiotic applied every 8 h, whereas 100% of mice in this group died within 4 days after the antibiotic treatment stopped (Fig. 4). Mice were infected with 2.5 × 106 CFU of strain Y8 via the ip and then treated with PBS or ceftazidime-avibactam. The viable bacteria were quantified in blood, liver and spleen at 3 dpi. The results showed that there was no significant difference in the amount of bacteria in the blood between the infected group and the treatment group. 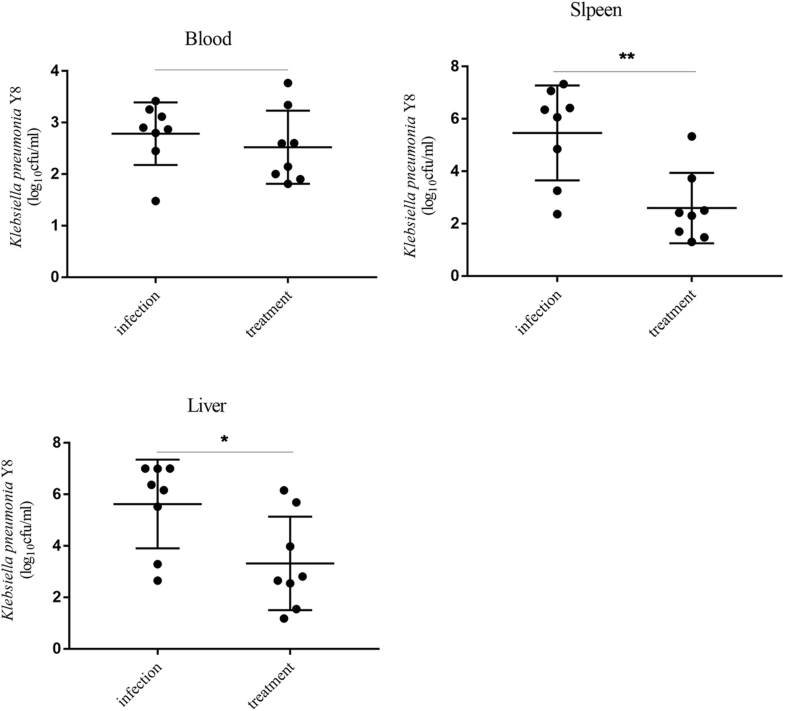 However, the spleen and liver of treatment group mice showed lower CFU counts, as compare with that of infected group, indicating that the antibiotic has significant effect on the bacteria and ceftazidime-avibactam led to a certain therapeutic efficacy (Fig. 5). In the recent decade, the prevalence and dissemination of CR-KP has posed a serious challenge in healthcare facilities in the world. The data from the Centers for Disease Control, USA disclosed the infection incidence of CR-KP increased from 1.2% in 2001 to 4.2% in 2011. In annual of 140,000 cases with Enterobacteriaceae infections, 9300 cases (6.6%) were infected by these multidrug-resistant bacteria . According to CHINET surveillance data, the resistance rate of Klebsiella pneumoniae to carbapenems were significantly increasing from 3% in 2005 to 20% in 2017 . Due to lack of effective antibacterial agents, infections due to CR-KP especially for hypervirulent Klebsiella pneumoniae usually accompany with high mortality [19, 20]. Carbapenemases are the major resistance mechanism of Klebsiella pneumoniae to carbapenems. Currently, the common carbapenemase among K. pneumoniae clinical strains include Ambler class A, Ambler class B and Ambler class D (eg. blaOXA-48, and blaOXA-232). blaKPC-2 is the most common carbapenemase in class A enzymes which can hydrolyze almost all of β-lactam antibiotics. blaNDM is the most common carbapenemase in class B metallo-β-lactamase which can hydrolyze all β-lactam antibiotics except aztreonam. Previous studies have shown the CR-KP strains isolated from children in China mainly produce blaNDM . blaOXA-48 carbapenemase are predominantly existent in Klebsiella pneumoniae isolated in Tokyo and Europe . In China, blaOXA-181 and blaOXA-232 have also been detected among Klebsiella pneumoniae clinical strains [23, 24]. Since CRE are usually extensively drug resistant, infections due to CRE are often associated with a high mortality. Therefore, a serious challenge of anti-infection therapy for CRE has been raised in clinical practice. Studies have revealed that compared to use carbapenems antibiotics alone, in the combination of carbapenems with other antibacterial agents such as tigecycline or polymyxin [25–28], amikacin  or fosfomycin  can considerably improve the outcomes of patient with CR-KP infection. Laurent adopted a combined pharmacotherapy regimen of dual carbapenems to provide a new approach in the treatment of CRE-induced infections . As a novel β-lactam/β-lactamase inhibitor, studies have shown that ceftazidime-avibactam can successfully cure the infections due to Enterobacteriaceae with blaKPC [32–35]. Nevertheless, it is worth to be noticed that with the increasing application of ceftazidime-avibactam, the resistant strains and failed cases have been reported [6, 7, 36]. Our results showed that all of 16 blaKPC-2 positive and 1 of blaOXA-232 positive Klebsiella pneumoniae were susceptible to ceftazidime-avibactam with MIC50 and MIC90 for both 8 mg/L. Time-kill assays demonstrated that it showed a significant bactericidal effectiveness for either blaKPC or blaOXA-232 positive K. pneumoniae at the concentrations of 2MIC, 4MIC or 8MIC of ceftazidime-avibactam. 1 and Fig. 2). At 1 MIC of ceftazidime-avibactam, most of K. pneumoniae strains started to regrowth within 4–6 h. These results mean that the dosage of ceftazidime-avibactam is very important in the treatment of infections caused by blaKPC or blaOXA-232 positive K. pneumoniae . In this study, 76.7% of blaNDM positive Klebsiella pneumoniae were resistance to ceftazidime-avibactam with MIC50 and MIC90 for 64 mg/L and 256 mg/L, respectively. Because avibactam can not inhibit the activity of metallo-β-lactamase, ceftazidime-avibactam monotherapy was ineffective for infections caused by blaNDM-1 positive Klebsiella pneumoniae . According to the results of time-kill assay, ceftazidime-avibactam combined with aztreonam is necessary for the treatment of infection due to blaNDM positive K. pneumoniae based on the characteristics of weak hydrolysis capacity of metallo-β-lactamases to aztreonam. Eric Wenzler et al. also demonstrated that the combination of ceftazidime-avibactam and aztreonam had a synergistic bactericidal effect against class B metallo-β-lactamase-producing gram-negative bacteria . Simultaneously, Benjamin Davido et al. reported that two cases infected either with metallo-β-lactamase-producing Klebsiella pneumoniae or Pseudomonas aeruginosa were successfully cured by combined administration of ceftazidime-avibactam and aztreonam . The results of antimicrobial susceptibility testing indicated 90% (27/30) strains showed a synergistic effect for ceftazidime-avibactam combined with aztreonam. After combined with aztreonam, the MICs of ceftazidime-avibactam for 27 strains were reduced 4–256 times than ceftazidime-avibactam alone and all of them were susceptible to ceftazidime-avibactam with MIC ≤8 mg/L. 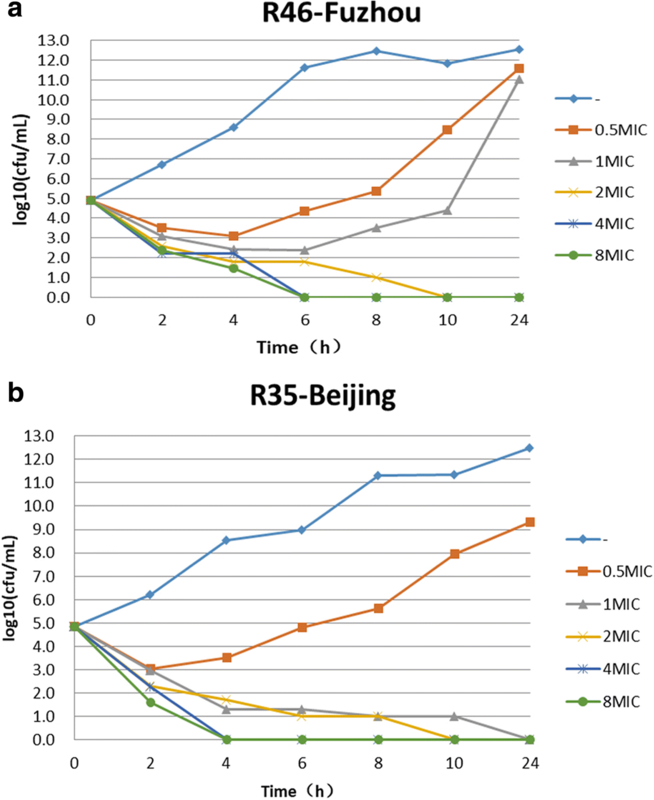 Subsequently, the bactericidal curve tests performed on 12 strains of Klebsiella pneumoniae with a synergistic effect were also shown the consistent synergistic bactericidal effects. The reduction of bacterial colonies number was >2 log10 CFU/ mL compared with monotherapy and no colonies were detected after 24 h. In addition to strain of R148 showing the synergism 8 h after combined therapy, three blaNDM positive Klebsiella pneumoniae clinical strains of R96, R97 and R100 did not demonstrate the synergistic effects after combined use with aztreonam, implying the other mechanisms of drug resistance may exist and require the further investigation in the future. In summary, as a compound preparation of novel enzyme inhibitor, ceftazidime-avibactam possesses visible advantages in the treatment of class A and class D type carbapenemase–producing Klebsiella pneumoniae clinical isolates. In addition, if combined with aztreonam, it can also play a synergetic bactericidal effects against infections caused by blaNDM positive Klebsiella pneumoniae clinical strains. Wenxia Zhang, Yan Guo and Jiayin Li contributed equally to this work. We thank all the laboratories for contributing data to this analysis. This work was supported by the National Natural Science Foundation of China (grant no. 81871690). PH, and FPH designed the study. WXZ, YG, JYL and YYZ performed the experimental work. YY, DD, and DMZ collected the data. FPH analysed the data. All authors read and approved the final manuscript. This study was approved by Huashan hospital. US Centers for Disease Control and Prevention. Antibiotic Resistance Theats in the United States. 2013. https://www.cdc.gov/drugresistance/threat-report-2013/pdf/ar-threats-2013-508.pdf.